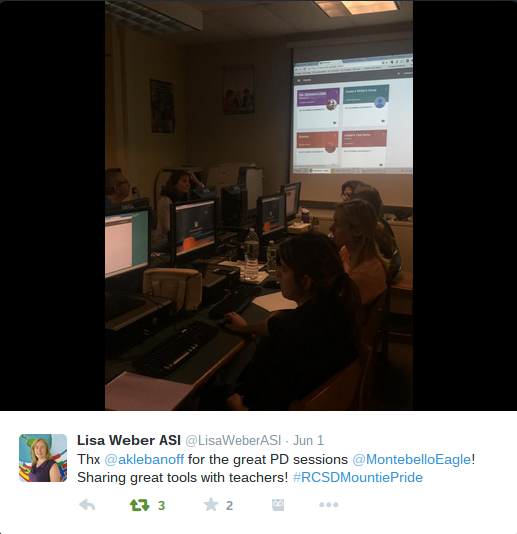 On Monday, Montebello had a different spin on it's PD sessions. Each teacher took a survey about 3 weeks ago asking their top three choices for PD session: Montebello PD Survey. These responses were tabulated and 4 sessions were created: Google Classroom, Google Drive, Gmail, and Google Add-ons, Apps and Extensions. Each session ran approximately 80-90 minutes with anywhere from 5-15 people in each session. At the end of the workshops teachers were asked to complete an evaluation of the sessions. 85% of the teachers who responded to the survey stated that they felt they had a better understanding of the tools they were taught in the workshop (i.e. if they were in the Google Drive workshop, they felt that they had a better understanding of Google Drive). Even ASI Lisa Weber made an appearance, Tweeting out some of the great work being done by the Ramapo teachers!